Shining Needle Society is pleased to present Vineyard Quilt Patch, one of Michael’s most popular teaching pieces, now revised and updated just for Shining Needle Society. Vineyard Quilt Patch is a quilt-inspired stitch sampler. It is an intermediate-level counted canvas design that can be finished as a framed picture, an insert for a lacquered box or a pillow. So, not only do you have a lovely piece that is fast and fun to stitch, you’ll also learn about thread blending and color as well, plus some really cool stitches. The finished design size is approximately 4 inches square. The working canvas is 10 inches square. The design is worked on 18-mono canvas. It combines overdyes from the Caron Collection, Vineyard Silks and metallic. Threads include Wildflowers, Waterlilies, Vineyard Silk Classic and Silk Shimmer, and Kreinik braid. 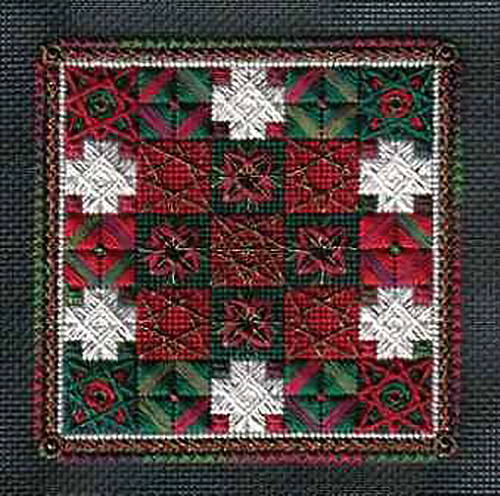 Stitches used in the design include: basketweave, Walneto, eyelet, various star overlays, giant rice stitch variations, star waffle, double-wrapped Smyrna, Eight-Point Star, Jessica, and plaited couching patterns. If those sound complicated, don’t despair. Carole and Michael have already made lots of visual aids and diagrams to make stitching this piece fun and easy.